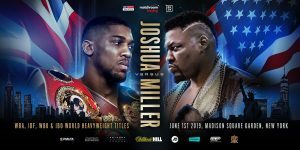 “Anthony Joshua’s World Heavyweight title clash with Jarrell Miller at Madison Square Garden is already the hottest ticket in New York after becoming the highest grossing pre-sale for a boxing event at the famous arena.” So beamed Matchroom Sports in a Friday press release boasting of its pre-sales for the Anthony Joshua – Jarrell “Big Baby” Miller showdown on June first at Madison Square Garden. The pre-sale numbers are nothing but good news for heavyweight kingpin Joshua and Matchroom honcho Eddie Hearn, who is hoping to make Joshua as big a draw in the United States as he is in England, where the 22-0 multi title holder is able to literally sell out stadiums. “We know that AJ is a huge box office hit in the UK,” said Hearn, “but to break the pre-sale record at the iconic Madison Square Garden is astounding…we are building a huge event on June 1 and we look forward to the all the build-up beginning with next Tuesdays press conference in New York.” Joshua’s American debut will put him up against the colorful Brooklynite Miller, who himself is undefeated, with a record of 23-0-1. The bout will be aired live on the DAZN streaming service. Like Hearn, Joel Fisher, the executive vice president of MSG Marquee Events, was quick to express his pleasure with reported pre-sales. “We are thrilled with the early excitement for tickets,” he said, “Anthony Joshua versus Jarrell Miller will be an epic event at Madison Square Garden and we encourage fans to purchase tickets now because this fight will sell out.” Boxing’s rejuvenated heavyweight division hit American shores, where it once dominated, in a big way last December when Tyson Fury battled WBC champion Deontay Wilder to a controversial, yet highly entertaining draw. An announcement for a rematch, which is also whispered to go down in the United States, is said to be imminent. Joshua-Miller will be the second major heavyweight title fight in America in roughly six months. For Joshua’s WBA Super, IBF, WBO and IBO belts will be on the line when he squares off against Miller in the late spring. The winner of the match will surely be called on to face the victor of the presumed Wilder-Fury rematch in order to bring some much needed clarity to the divided heavyweight division. Although Joshua will presumably be the favorite leading up the Miller bout, Miller, the hard punching former kickboxing star, brings big power…and perhaps an underrated skill set of his own. What’s more, Miller is in possession of a showy, and outspoken personality, something that will surely be used as a selling point.